When patients search for healthcare professionals, they are most likely to add search queries that include ‘near me” or a search string that specifies their location. This is because patients are most likely to look for physicians who are at their closest proximity. Your healthcare marketing strategy must revolve around local SEO. To keep in line with the changing healthcare marketing trends, players in this sector must try to rank well for local searches, popping up in the much-coveted location preview on Google. For this, location-based keywords need to be optimized which will be extremely useful in garnering customers using voice searches. Social media is gradually becoming an essential element of healthcare marketing strategy for agile players in the healthcare sector. Though providers must be extremely careful not to divulge any vital patient data or incidents on social media, this powerful tool can be used to build trust and relationships with the patients. Social media is one of the noted healthcare marketing trends, which is a great way to take word of mouth healthcare marketing and amplify it in a public setting. Patients can also provide testimonies of their experience on the company’s social media profile, which improves their reputation. The use of mobile has only skyrocketed over the past few years, which means that having a mobile-optimized site will soon be an integral element of any healthcare marketing strategy. The mobile-optimized sites must-have features such as easy-to-use drop-down menus that quickly display the information patients are looking for and a click-to-call mobile numbers on your page for easy access. Smart players in the healthcare space have come to terms with the fact that customization and personalization in their healthcare marketing strategy is the way to stay ahead in the game. Personalization of content is known to generate greater interest and response. 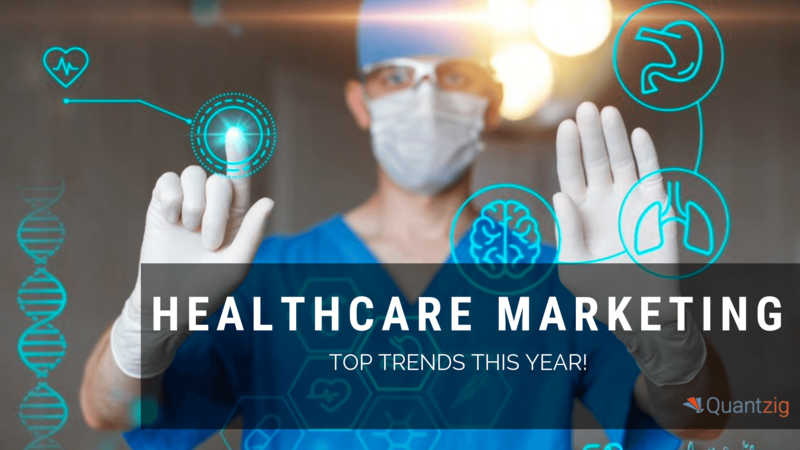 Also, blogs on the provider’s website is another key healthcare marketing trends that have been garnering immense attention from the audience. These blogs not only talk about a particular health condition that a user might have searched for but also has the contact details of the physician who can be consulted to cure that particular ailment.